Domesticated hamsters are fond of eating different types of fruits that humans consume including mangoes, bananas, apples, strawberries, kiwi fruit, pears, blackberries, blueberries, and so on. However, you should strictly refrain from giving your pet hamster citrus fruits like lemons, oranges, tangerines, grapefruits, Clementine, and tangelo. Since these kinds of fruits are rich in citric acid, consuming the same might cause acidity leading to digestive problems. The answer to this question is a simple and straightforward yes. And as long as you monitor the manner in which you offer it to your pet, there should be not any problems associated with its offering either. You should ensure that you don’t present whole bunches of the fruit even if your pet is willing to take it in that form. How will Hamsters eat Grapes? You should make it a point to painstakingly peel off the skin and thereafter cut up each and every grape into small pieces so that the pet finds it easier to gulp down the portions. However, the best way to offer grapes would be to slice them into halves or quarters that’ll enable them to swallow the pieces or portions very easily. Your hamster might also encounter problems in ingesting the seeds embedded in the fleshy part of the grapes. You can solve this issue in two distinct ways-either you can deseed every single grape or you purchase grape bunches that have been deseeded. Offering seedless grapes completely relieve you from the worry of this food item getting stuck in the food pipe and choking the hamster’s esophagus. 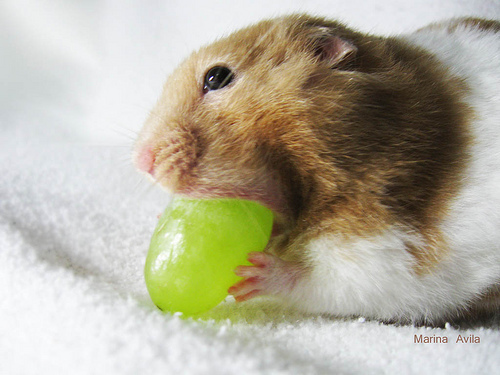 Ordinarily, most species of hamsters don’t have any issues with consuming grapes on the whole, but there is likelihood of your pet experiencing discomfiture when you try to feed it. What Quantity should be offered? Making four portions from a single piece of grape and then offering the portions to your hamster would suffice. You can let your hamster eat both the green or black grapes as both the varieties are completely safe. So that you can establish your pet’s receptiveness to grapes, you can attempt to feed a tiny chunk or portion of the fruit. In case she merrily nibbles on the helpings from your hand and gulps them down, it’ll be a crystal clear sign that she likes grapes. So, as long as your pet merrily munches away grapes and doesn’t fall in the event of consuming them, you can think about adding more pieces to her regular diet. What should you do if your hamster doesn’t eat the fruit? Conversely, if she ignores helpings or portions that you try to offer it from your hand, then you can infer that she doesn’t like the fruit and consequently you should desist from insisting it. You should keep this aspect in mind that like human beings, hamsters too have their likes and dislikes about food. In any case, you should always avoid giving grapes in large quantities as consuming a sizable portion might cause diarrhea or dysentery.